I don’t care how old you are, there is something about the magic of Christmas that brings out the child in all of us! Christmastime is a time of awe and wonder, a time when we believe in miracles. It is a time to remember the past and look to the future with renewed hope. We capture this spirit of Christmas in the traditions we uphold. One of the simplest ways to add a little Christmas magic into every single day of the season is with an Advent Calendar. Counting down to Christmas allows the child in all of us to come out and play. 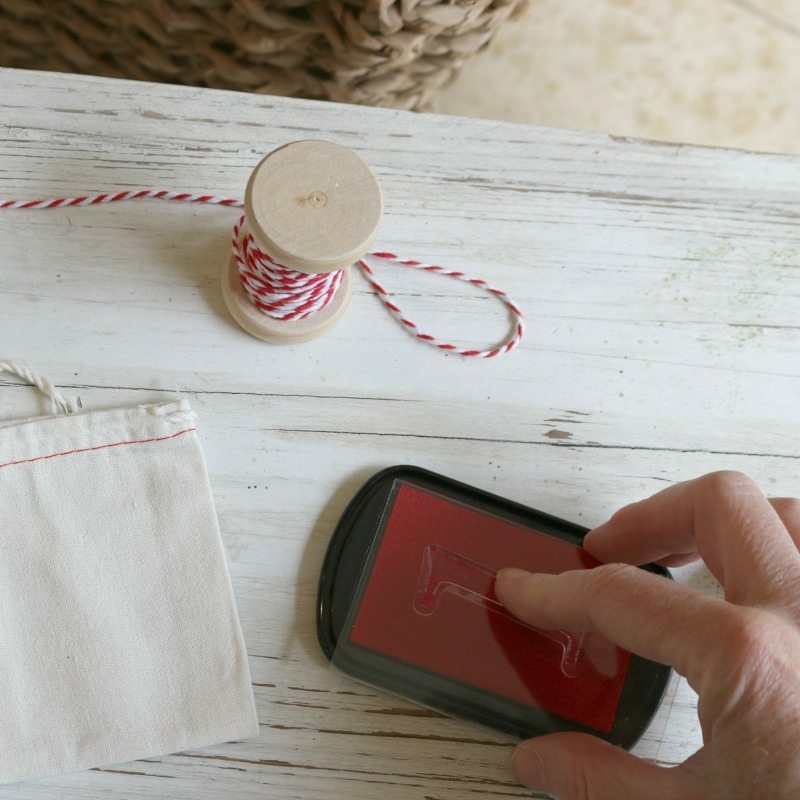 Today we have teamed up with 9 talented bloggers to bring you 10 fun, creative Holiday DIY and Craft projects! 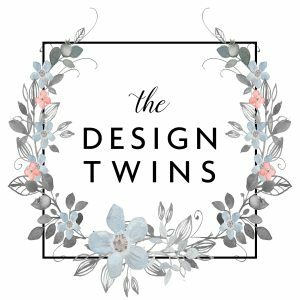 At the bottom of this post you will find a list of all their blogs and links so you can explore them all! We invite you to grab a cup of coffee and enjoy visiting these blogs. We know you with find lots of inspiration for your next craft project. Every year just after Thanksgiving my son Roan starts to get excited for Christmas. It usually happens as he sees me getting out the Christmas decor and at a certain moment it dawns on him….it’s time to get out the Advent Calendar!! For him…..the excitement and anticipation of the season begins!! When my boys were younger I used to take charge of the calendar and fill it with treats so that every day would be a bit of a surprise. Most days they would forget about it and I would have to remind them. We had a special agreement that they were allowed to EAT their treat even before breakfast in honor of the festive season! And yes, I did use this as a way of pulling them out of bed on more than one occasion! As soon as I mentioned the advent calendar my otherwise reluctant, sleepy boys would literally bound from their beds in excitement! Now at the ripe old age of 12 Roan likes the task and responsibility of putting the advent calendar together all by himself. He tells me what types of treats he wants and he enjoys filling each day with 2 treats, one for him and one for his brother Reese. Reese is happy enough with this arrangement. Participating in the receiving and eating side of the advent calendar is plenty for him! Of course when the boys saw me putting together this new advent calendar they were extremely excited. I am sure they are picturing the extra treats headed their way! But the magic of the Advent Calendar is found in more than just a piece of candy or a surprise gift. It is in creating a ritual or tradition that is unique to the season. A tradition which builds on the anticipation of the special celebration of Christmas that is soon to come! After all….Christmas is about so much more than just celebrating one day. It is about building special traditions with our family! Traditions that will bring joy and togetherness; that create memories that we will all cherish for years to come! 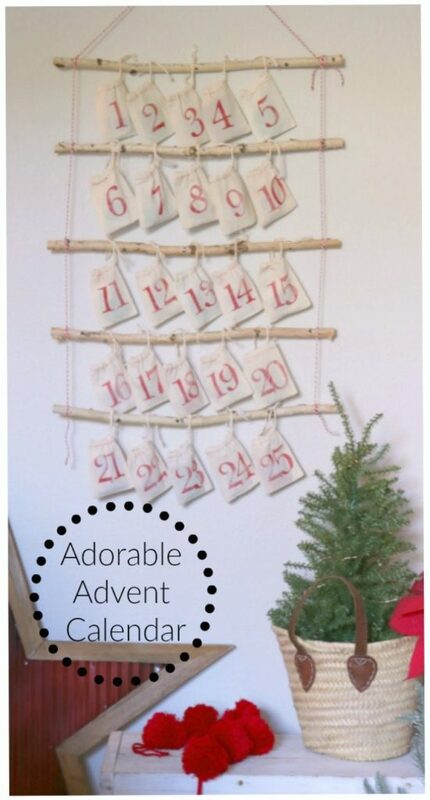 Let’s Make an Adorable (easy) Advent Calendar! The great thing about stamping, especially for this project, is that it doesn’t have to look perfect! In fact, I kind of like the look of a slightly imperfect stamp so that you get the idea that it is homemade. 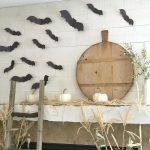 Imperfection gives it a charming, farmhouse rustic look. So….don’t worry about the stamping. It’s so easy you can have your kids do it! Well, maybe not–unless you want to risk having red ink all over your home. It does tend to get all over and a small warning….if you get it on your fingers (which you will) be careful handling the muslin bags. The red ink stains them quite easily. And yes, I had to learn this the hard way too! 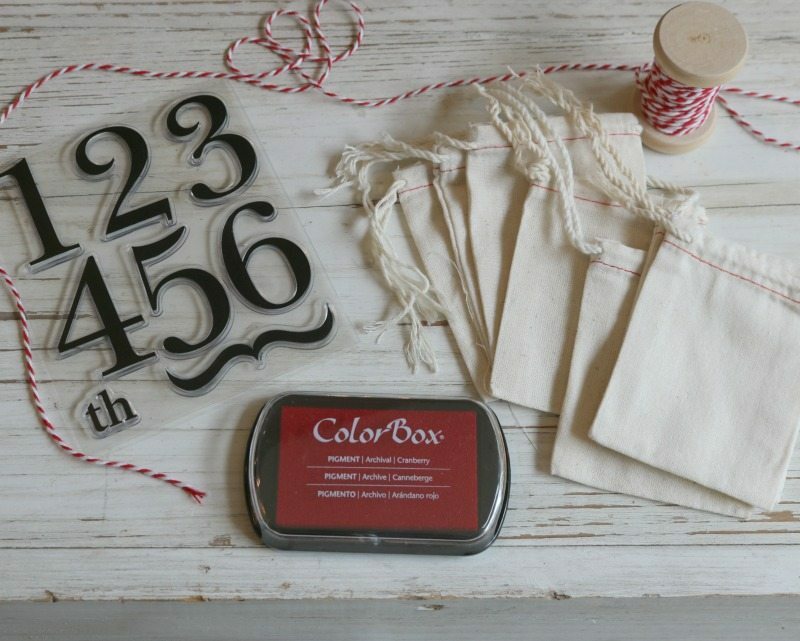 Place the rubber number on your acrylic stamp block and ink it up! Be sure to press and repress until you see a solid amount of ink on your stamp. Next, place the stamp on your muslin bag. Center it if there will only be one digit. Line it up to the left side if there will be two digits. Let the stamped image dry. Also, be sure to wash your stamps after each use. Note: I found it easiest to stamp all the bags with the number 1, and all with the number 2, etc. to save time switching out the numbers and washing. Tie the bags onto the branches. Depending on the length of your branches this will determine how many bags per branch and how many branches you use! There is no right or wrong. 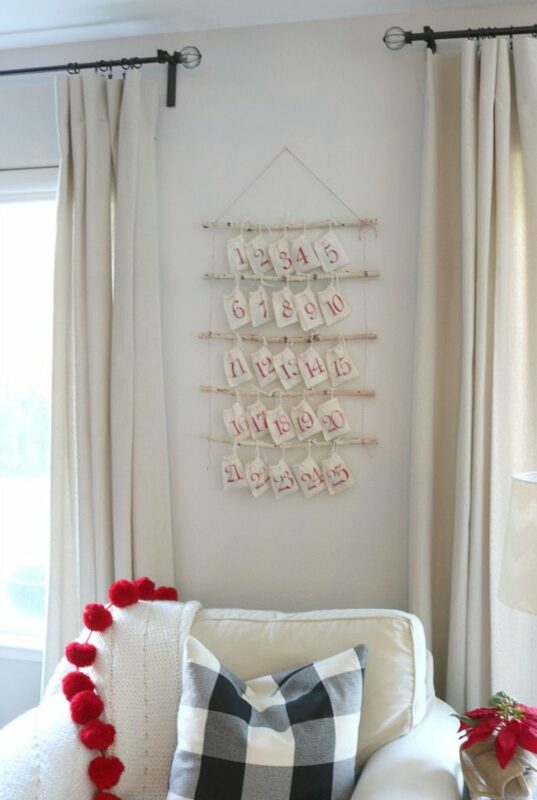 Note: If you have the luxury of lots of sticks to choose from I suggest thinking about the area where you want your calendar to hang and create a shape to fit the space. Also, creating the shape of a Christmas Tree would be especially delightful! 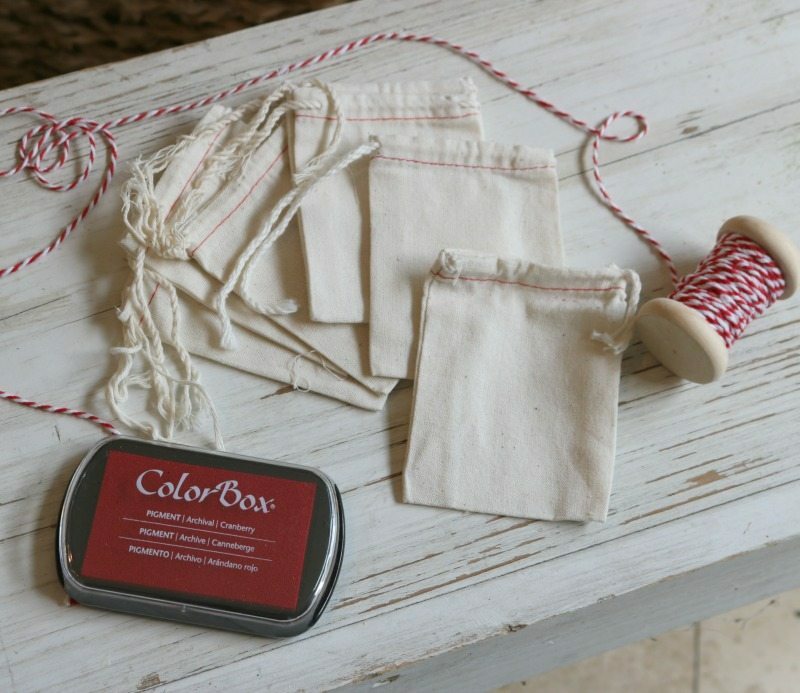 Using your red and white Bakers Twine tie your branches together. Start at the bottom left and work your way up. Make the distance between each branch uniform. You can eye-ball it as I did. When you get to the top leave enough to hang the calendar. Then head down the right side, making sure the branches are level as you go. 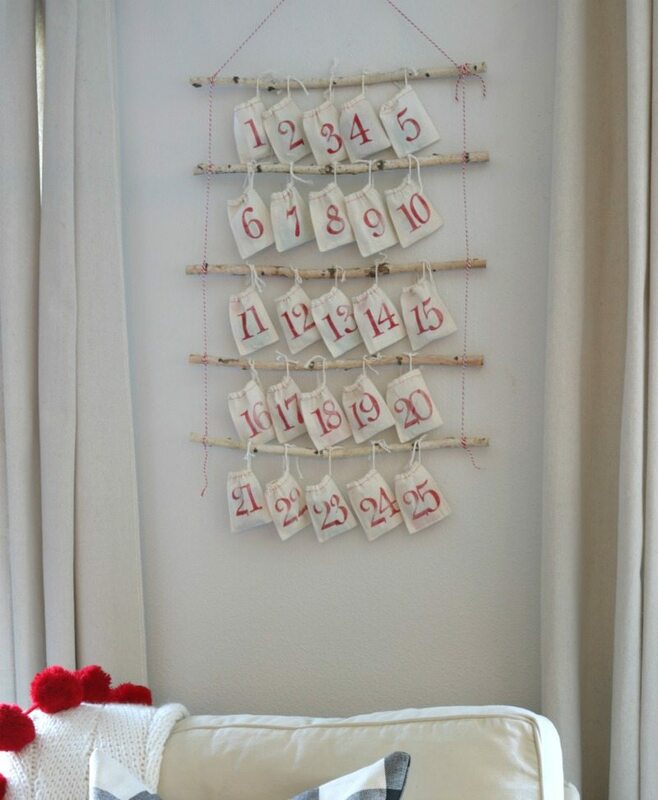 For another FUN and EASY way to add the joy of Advent Calendars to your holiday traditions here is a cute idea that my friend Janine @HappyHappyNester came up with using her Christmas Tree! Take a look at her clever idea right HERE. How you fill your advent calendar will be as unique as you are! Each year you can make it fresh and mysterious or you can fill your calendar with your tried and true traditions. 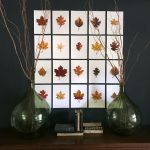 Create the calendar for a loved one, the children, a gift, or even yourself. 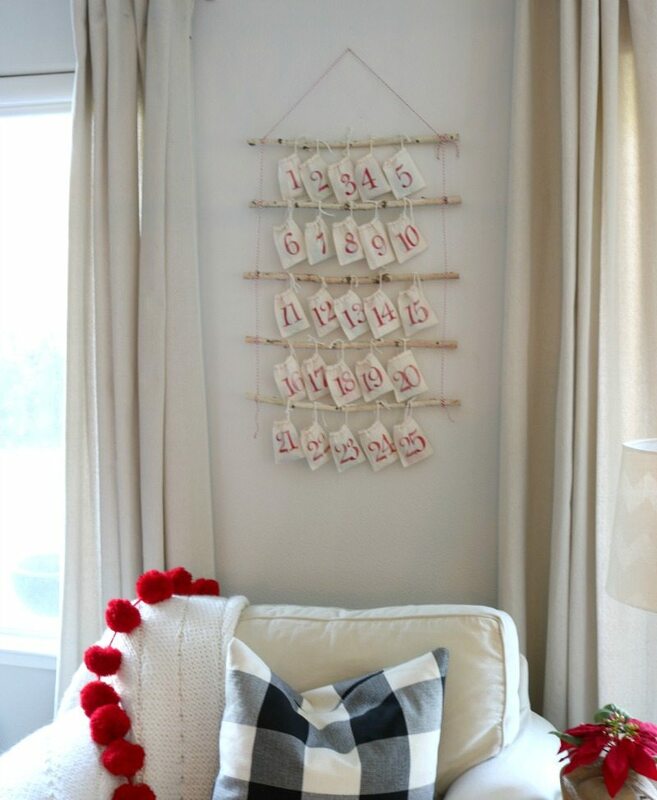 As you read through this list you will see how creating an Advent Calendar for a special loved one would make a really amazing and thoughtful gift! 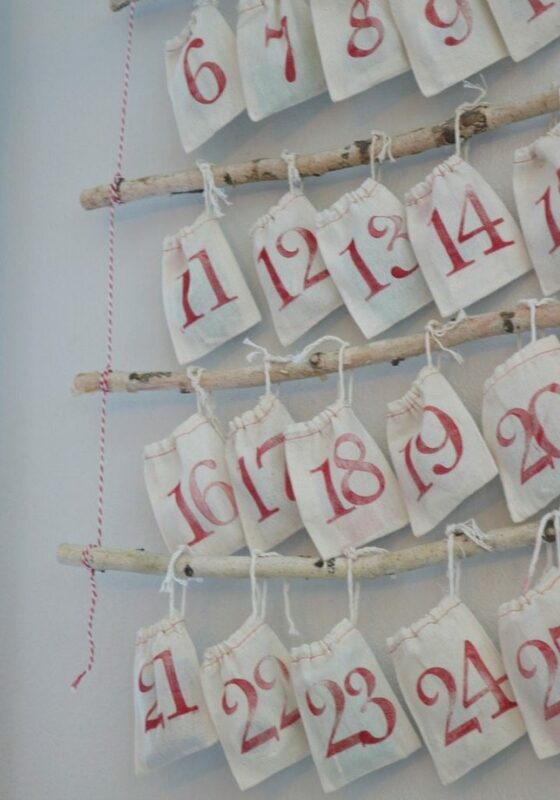 I love how these ideas can make your Advent Calendar experience extremely personal. coupons for holiday activities, these can me experiences like baking cookies, attending a tree lighting, etc. small toys that by Christmas create a set or small pieces, accessories that lead up to a big Christmas gift, i.e. lego pieces or cars to a race track or trains for a train set, dolls or furniture pieces to a doll house etc. family game ideas/instructions…old fashioned games that can be played at the table or in the car with little to no equipment that get people off their devices and interacting (like the good ole days 🙂 If necessary, include the small supplies needed like a pair of dice or a deck of cards. 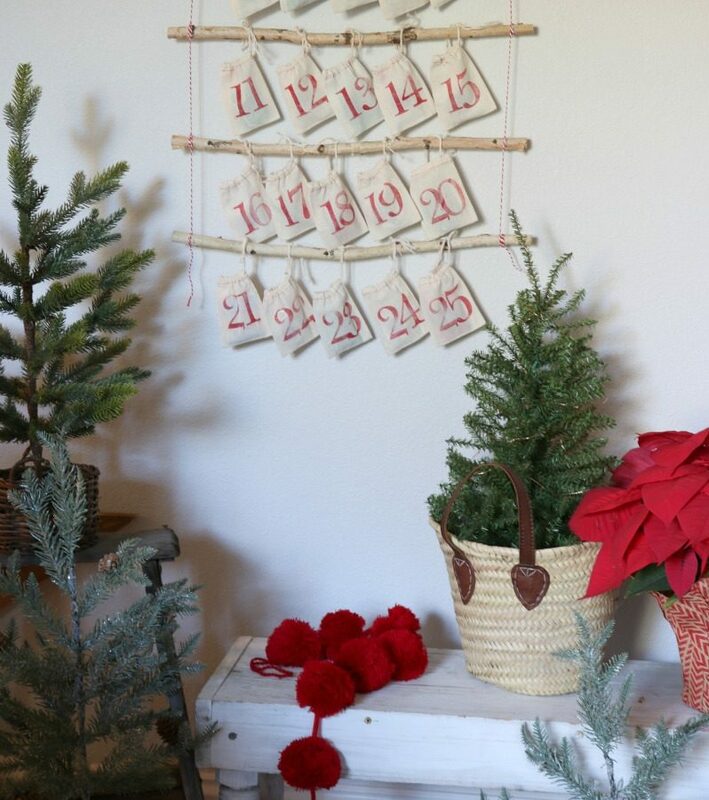 Creating an advent calendar adds a little Christmas joy to each day of the season. No matter how busy your holidays are, the activity of opening your Advent Calendar can be a small respite in the midst of the flurry. 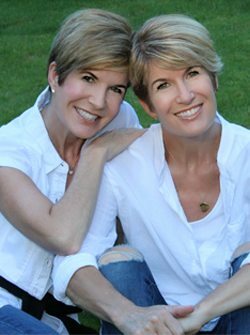 It is of course a fun way to anticipate the big day, but it also creates a little mini celebration every day of the month. For adults it reminds us of the magic we felt as children anticipating Christmas. For children it adds to their excitement and creates fun memories. 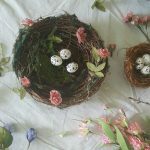 These are the traditions that will remind them of their happy childhood and the traditions they will carry through their lives with their own families. 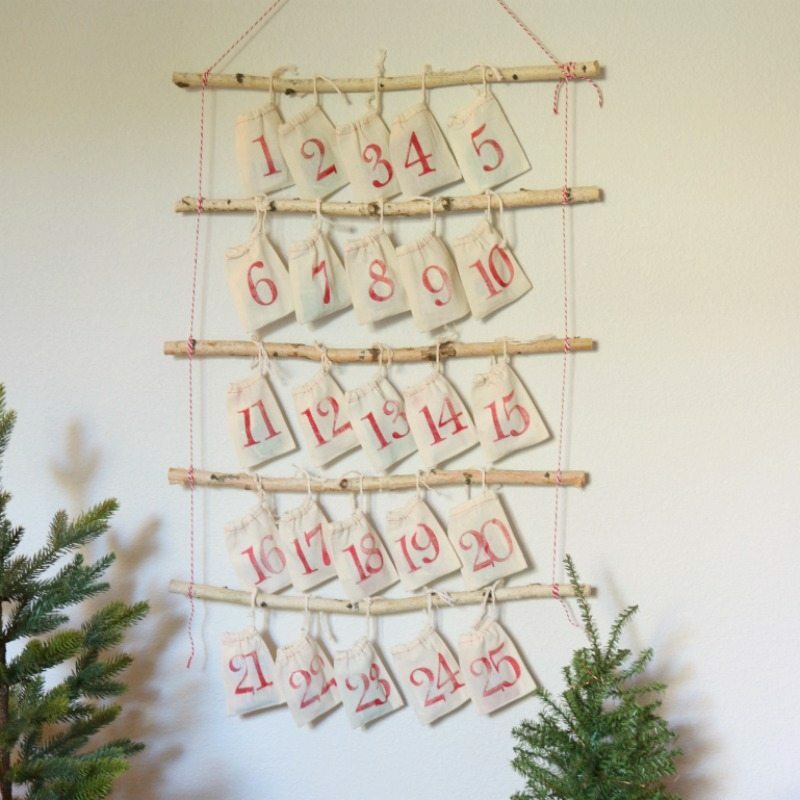 An Advent Calendar enhances our enjoyment of the holiday season in all kinds of ways. By creating an experience you are creating memories that will last a lifetime. 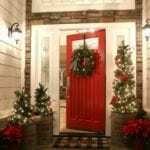 We hope these ideas help you create your own holiday traditions. We love to hear from you. Share your Advent Calendar memories or traditions with us in the comments. Which of these ideas do you love? 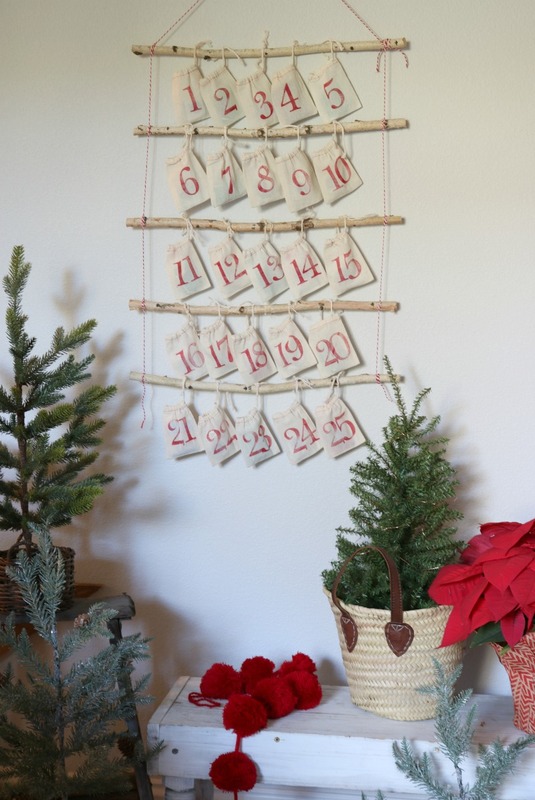 Make this easy DIY Advent Calendar for the whole family to enjoy! Enhance your holiday season by creating your own traditions with unique, new ideas for filling your Advent Calendar! Create, Give & Enjoy! What a beautiful idea! and I loved the video too! I will be trying this for sure! 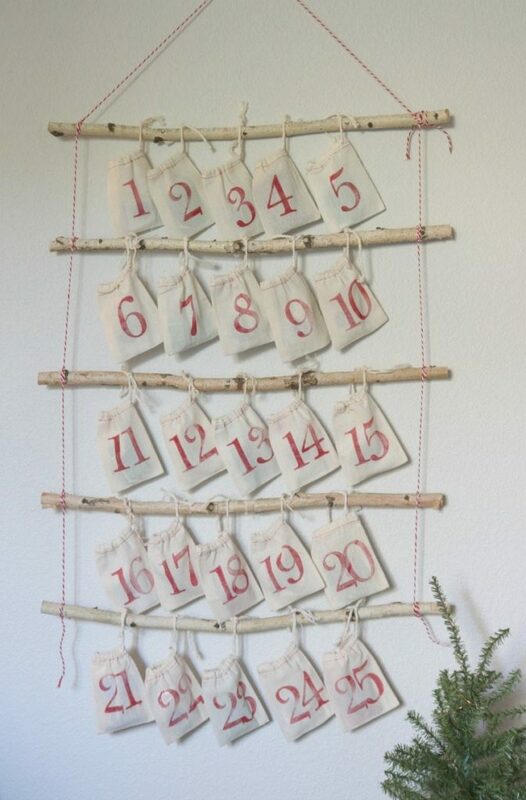 Your advent calendar is so cute and feels like an easy project. 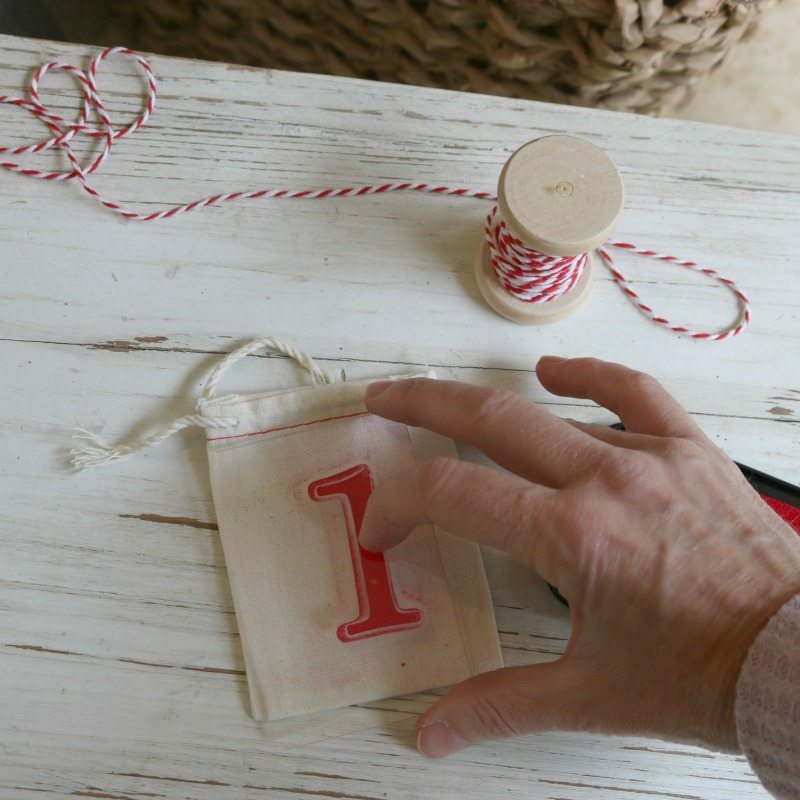 I love all the adorable bags and how you numbered them. I see your advent calendar as a yearly tradition that will bring many fond memories for a long time. And of course, all your fun ideas for after the holidays are the best! This is gorgeous, will have to pin this for next year for my girls! I love the little bags and just big red numbers on it! This is adorable! I love the idea of putting love notes in there! We all need a little more love in our lives! The cute little numbered bags make me feel nostalgic. They are simple and quaint and remind me of the gold nugget gum bags I use to love when I was little. Love this idea. Such a fun advent calendar! 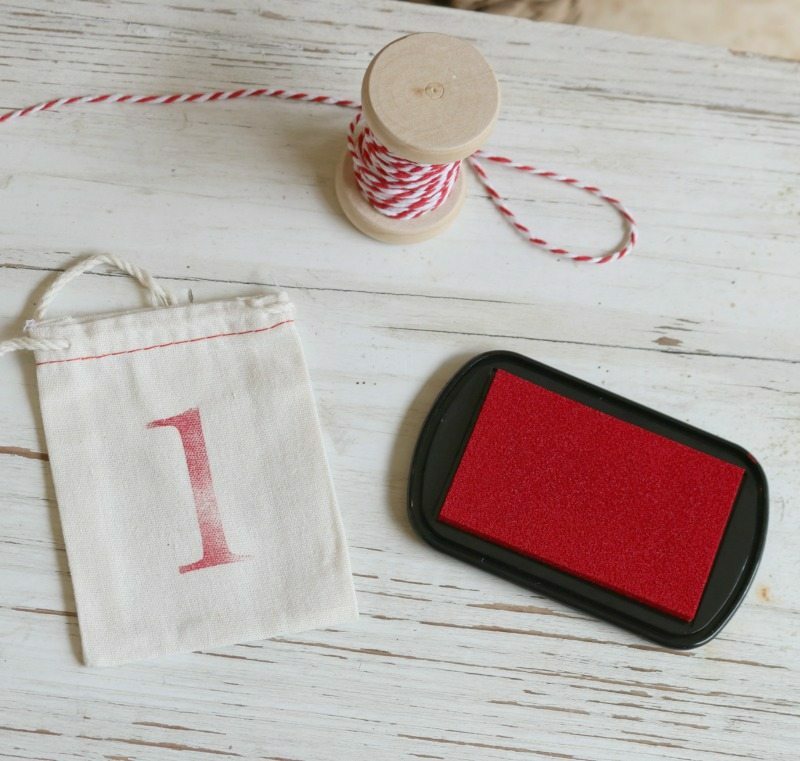 Love the idea of using stamps to make the numbers. I love how you can insert your own items in the bags for those who are on special diets. And the toy parts that can be assembled on Christmas is a great lesson in patience! Genius!